The 2005 Honda CRF 450 X for Sale is in basically stock concition except for a Renthal Fat Bar, bendable levers, a jetted carb and opened air box, Scotts Steering Stabilizer, oversized radiators and the smog kit has been removed. The engine still has lots of power but the bike could use a new battery. These bikes are a big bike with lots of powerful performance suited for a REAL rider who can handle lots of power with no problems. I am the second owner of the used Honda dirt bikes and bought it in 2008 and since that time I've ridden it about 3-4 times a year . The 2004 CRF 250 X for sale is in good running condition other than some scratches but is still pretty clean. 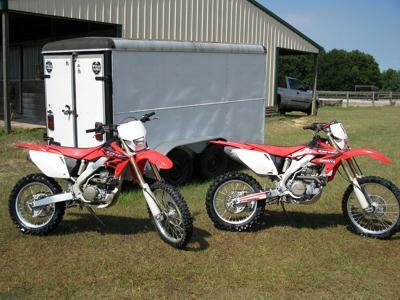 The 2005 Honda CRF 450 X for Sale is in Santa Rosa CA California and my price is $3000. Call me (no e-mail)if you want more details on the CRF450X at (707) 293 five five five 6 and don't forget to mention that you found this ad on GoGoCycle's Honda Dirt Bike Classifieds www.gogocycles.com when you call. Do you sill have the bike?